Chief Judge Dana Williams swears in Henry Patterson as the Alabama-Coushatta Police Force Chief Officer on May 14, 2015. 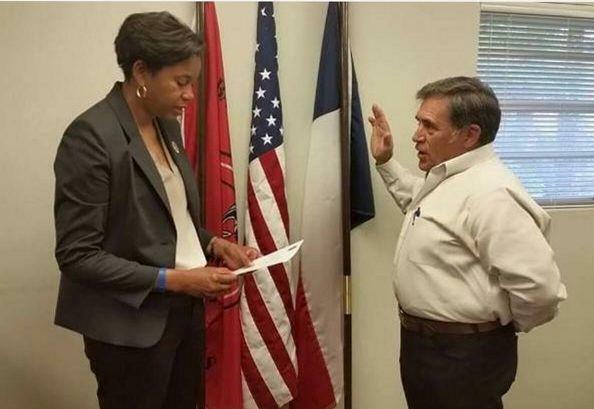 Tribe Swears in a Second Police Chief, ALABAMA COUSHATTA TRIBE OF TEXAS, May 15, 2015 - On Thursday, May 14, 2015, Alabama-Coushatta Chief Judge, Dana Williams, swore in Henry Patterson as the Police Chief of the Alabama Coushatta Tribe's highest ranking law enforcement chief. The ceremony took place while current AC Police Chief, Antonio Ford is off for medical reasons. The move seems a bit odd since Chief Ford is listed with the State of Texas as the Police Chief, and, by state law, there can only be one Police Chief. Chief Ford is Texas Commission on Law Enforcement certified (TCOLE). Mr. Patterson will be the highest ranking executive of the AC Police Department and will reevaluate the department to make the department more efficient and work in conjunction with the Tribal Courts. Tribe Creates New Position, Appoints Law Enforcement Director, ALABAMA COUSHATTA TRIBE, April 25, 2015 - The Alabama Coushatta Tribe of Texas has created a new position to head up their police department. The Tribal Council appointed former Liberty County Sheriff, Henry Patterson to the new position of "Law Enforcement Director". The new position puts Patterson over Current Police Chief, Antonio Ford. Patterson was the Liberty County Sheriff from 2008 through 2012 until he was soundly beaten in an election by current Sheriff, Bobby Rader.